Things have come a long way in the last few months since KCR was trying to spearhead a non-Congress, non-BJP front, and Naidu was a member of the NDA. The powerful leaders of Telangana and Andhra Pradesh seem to have put the idea of a Third Front or Federal Front on the backburner. Instead, in a volatile political scenario, Telangana CM K. Chandrasekhar Rao seems to be gravitating towards the Bharatiya Janata Party-led National Democratic Alliance, while Andhra CM N. Chandrababu Naidu is cozying up to the Congress-led United Progressive Alliance. This is a far cry from a few months ago when KCR, head of the Telangana Rashtra Samithi, was trying to spearhead a non-Congress, non-BJP political alternative, while Naidu’s Telugu Desam Party was still a member of the NDA. On 15 June, KCR called on Prime Minister Narendra Modi, leaving political tongues wagging. He didn’t even make any attempt to brush them off as just “rumours” started by his detractors. Then, on 27 June, KCR’s son and Telangana IT minister K.T. Rama Rao also met the PM, who had denied appointments to Kerala chief minister Pinarayi Vijayan and some elected representatives from Andhra Pradesh. Compare this to the April-May period, when KCR was postulating ideas and commencing an exercise to agree upon a “national agenda” by meeting prominent regional leaders like West Bengal CM Mamata Banerjee, former Tamil Nadu CM M. Karunanidhi and his son M.K. Stalin, H.D. Deve Gowda and his son Kumaraswamy (now chief minister of Karnataka), as well as former UP CM Akhilesh Yadav. However, he has played his hand carefully, not shutting the door on the idea of a Federal Front, obviously for strategic reasons. When he was in Chennai to meet Karunanidhi and son, a journalist asked KCR if he was open to working with the Congress – his main opposition party in Telangana. He displayed dexterity by ruling out the possibility, and even hinting that he wasn’t averse to the idea if things moved in that direction. While KCR has left political analysts as well as Congress leaders scratching their heads, his former boss Naidu has been spitting fire against the BJP and Modi since walking out of the NDA in March for not acceding to the demand of Special Category Status for Andhra Pradesh. Naidu couldn’t conceal his future gameplan when he rubbed shoulders with Congress president Rahul Gandhi in full public glare and in the presence of Mamata Banerjee, Akhilesh Yadav and Communist leaders Sitaram Yechury and D. Raja at the swearing-in ceremony of Kumaraswamy in Bengaluru. He gave out the clear signal to the other politicians that he would prefer a Congress-led coalition than a Third Front. This came as a surprise, for not only is anti-Congressism the pillar on which the TDP stands, but Naidu himself was the architect of the non-Congress, non-BJP United Front government of Deve Gowda and I.K. Gujral in the 1990s, before joining the NDA fold in 1998. Considering his experience and manoeuvring skills, some leaders have been looking to Naidu as a spearhead of the anti-BJP coalition. This naturally irked KCR, but he hadn’t yet made many obvious moves in the opposite direction. Things came to a head in the midst of the sordid Arvind Kejriwal-versus-Lieutenant Governor episode in New Delhi, on the eve of the NITI Aayog meet. Naidu wanted to hog the limelight, but somehow, Mamata Banerjee emerged as the cynosure, leaving Naidu to play second fiddle. This further seems to have pushed Naidu into the Congress’s corner. 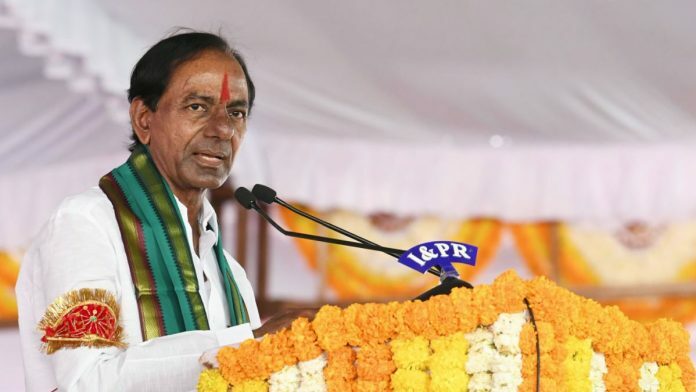 At around the same time, KCR met the Prime Minister and also stayed away from rallying behind Kejriwal with his other counterparts, signalling his shift towards the BJP. Will KCR’s TRS join hands with the BJP openly? Certainly not. He has a strong political ally in Asaduddin Owaisi, the MP for Hyderabad and supremo of the All India Majlis-e-Ittihadul Muslimeen, and KCR will never want to rub Owaisi the wrong way. However, the man known as the creator of Telangana may not be averse to supporting Modi if the latter falls short of numbers and seeks a ‘strategic’ post-poll alliance. It does seem that both states are preparing for early polls. KCR suggested he was game for an early election, and wouldn’t mind simultaneous polls with the Lok Sabha. He has begun inducting adding some muscle to his party, while also cutting down on some flab. Naidu, on the other hand, also seems to be prepared to follow suit, portraying his bete noire Y.S. Jaganmohan Reddy as cohort of the BJP. But he’ll also expect to be the glue guy who brings and keeps anti-BJP forces together. The author is a senior journalist and columnist based in Hyderabad.